I was talking to an incredibly smart woman last week, who also happens to have been a client of mine for four years. She said she wanted her daughter to stay in gymnastics and was willing to pay extra for a good place so her daughter could learn to cartwheel. The mom felt like it was one of her regrets, never learning how to cartwheel herself. It made me wonder, why do we think gymnastics is for kids? Or even more, why do so many people think games are just for kids? OK, the Olympics are for adults, but hopscotch, jumping rope, just bouncing a ball, etc. is “supposed to be” for children. How did we get such a cognitive dissonance between the two? With Screen-Free Week coming up, take each night that you’d watch TV, and turn it into an active night. 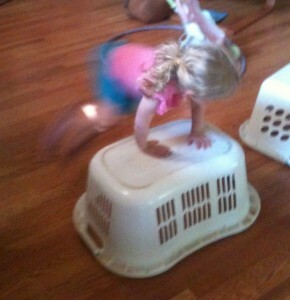 Set up a gymnastics or circus circuit in your home instead. On Monday, put masking tape down in your living room and walk, jump, twirl, and cartwheel along the “balance beam”. If you live on a quiet street, go outside and use the curb. Start small by just balancing on one leg along the line. On Tuesday night, use the side of the couch, laundry basket or the bathtub as a pommel horse. Yes, you’ll need to allow yourself and the kids to flop and jump on the couch some, but it will be incredibly fun, memorable and good exercise. Think of what you see gymnasts do and try a smaller version. Put your hands on the edge of the couch and see how long you can hold yourself up. Do push-ups on it, or let your child swing both feet over the top while holding on with both hands. Trampoline and or “floor” work can be Wednesday night. Bounce on the bed, or push back the couch and play. Walk your feet up the wall to try a head or handstand. Attempt a cartwheel even if it looks bad. It will get better. Do somersaults and crab walks. Attempt a backbend if you are really feeling brave. The even (or uneven bars if you are female) is trickier to create at home. On Thursday, see if you can go to the playground and experiment at the park. It’s fun! Don’t let the excuse “I have no upper body strength” sto p you. You have more upper body strength than you think. Really. Alternatively, find a super sturdy dining room/office chair with arms. Sit on the chair, put your hands on the handles and lift yourself up, so nothing is touching the floor. It’s hard; it’s not you. Compete with your kiddo and see who can go the longest. Invent new ways to use your even bars. My kids are great at this, although I can barely do most of the things they create. Nevertheless I try, we laugh, I’m humbled and the game continues. National Parks have waived their entrance fees for the week to encourage you and your family to visit. Outdoor beauty and active play equals a perfect day! 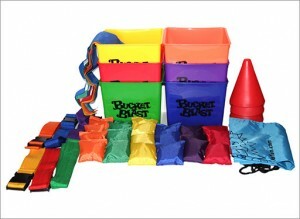 Lolo Bucket Blast is a group of 15 indoor and outdoor active games. The 6 buckets, belts, blindfolds, cones and 24 bean bags come with instructions for the myriad of games that range from Beanbag Basketball and True Partnership to Totally Wet and Shot in the Dark. The games are for adults and children over 6. Try one of the 15 included games or make up your own. Play with 4 people or 20. Don’t wait until you are in the mood, just play! Or, simply stick a bean bag on your head and walk around the house competing to see who can go the longest without it falling off. Really, games begin in the simplest ways. I like to pretend the bean bags are pellets in Pacman. The couch is the safe zone, we set a timer and go. Who can gobble up the most bean bags (or any toy, book or block) before the timer goes off and/or is “eaten”? Try playing it the whole time in a plank, squat or lunge position for a strength rather than cardio variation. You can make up any kind of game that includes your family’s interests, or play the 15 games they suggest. Use the bean bags for snow ball fights or throw something to improve your eye-hand coordination; get some cardiovascular exercise or balance challenges; (depending on the game you play), and have a super memorable family time all at once. Not bad for some buckets and beanbags! I was discussing this fascinating article with a group of people I taught on Monday morning. Last week weight lifting rats, this week, ones who prefer sugar to cocaine. I really like this video. 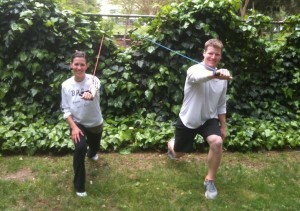 Whenever I train couples, groups of friends or parents with their children, we do a bunch of partner moves. I always thought I created them myself, but apparently I’m not the only “crazy” trainer! Amusing family fitness couldn’t be easier! I don’t suggest all of these moves, particularly the Kettlebell Turkish Getup with a partner as the Kettlebell. However a lot of these moves are really fun, effective and adaptable to people of different sizes and strengths, and can be done anywhere at anytime. Like the wheelbarrow , hand slap and leg wrestle games I’ve mentioned before, many of the moves are related to that. The difference is, in the video, they go through the moves really quickly, whereas I have people hold the moves longer and make a game of it! Try both and see what you like best. Then do it again! Skip the first 15 seconds of the video, something is wrong with it. Check out the video and try some fun moves! The two pictures that go with this blog are incredibly endearing to me. I teach this phenomenal group of 13 families on Tuesday afternoon. We’ve played with tennis balls before as massage tools and also just fun toys to add to our workouts. At the end of class on Tuesday, I noticed one woman helping another with her back pain, using two tennis balls along her spine. Five minutes later, I realized her son, was doing the very same thing, helping his mom as her friend had. 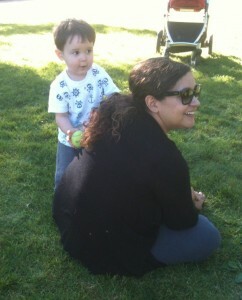 If that isn’t exercise imprinting and role modeling being thoughtful, I don’t know what is. SO sweet! If you wanted to have one awesome exercise toy in your house that could give you a full body strength workout, anywhere, anytime, and nobody at work or home will hear you, buy an exercise band for about $10. The list of exercises you can do with it has no end. The only limiting factor is choosing not to pick it up. I can list a thousand descriptions of how to use the band, but there are many websites and YouTube videos that have free suggestions. Keep the band under your work desk or by the kitchen counter. Each week while you are cooking or procrastinating at work, try one new exercise. I know many people who just exercise while at their desk or watching kids do homework. They use the band when reading documents or on conference calls, and by the end of the day, they have finished 30+ minutes of strength training. If you added one new exercise a week, by the end of the year you’d have one fit body and mind. One of the my favorite bands (it’s hearty, inexpensive and no, I don’t get a kick back from them for saying this) is this one, by SPRI. Splurge and spend an extra two dollars on the door attachment. You’ll essentially have a whole cable exercise system in your home for $12 that barely takes up space. There are a lots of exercise videos on amazon, and youtube. Check out your local library too. I like this video because it shows how you can use the band anywhere and get a great full body workout. This guy shows how easy it is to use the band. Tie your band in a circle to perform all of these. These are more rehab and single muscle exercises. Band together and get stronger! 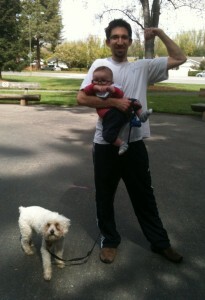 Who brought his baby and dog to exercise class, while his wife went away for the weekend with friends? Woot, woot!